Oh my gosh I never thought it would be good but it was amazing! 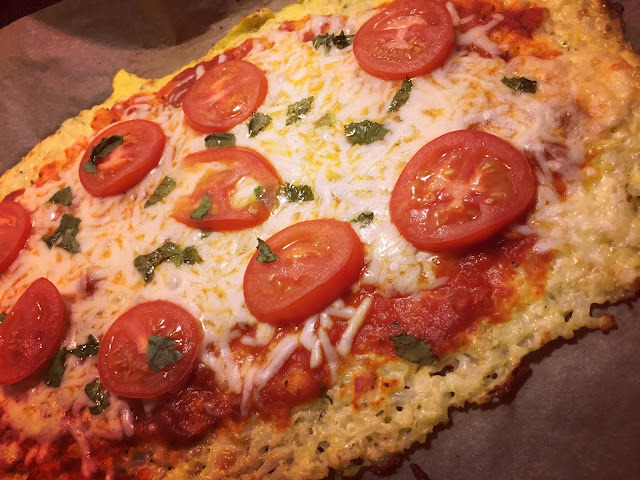 I used riced cauliflower from Green Giant, shredded cheese from Shoprite, Parmesan cheese (BelGioioso) cherry tomatoes also Shoprite, jar sauce (Rao's), fresh basil, and some oregano. Parchment paper on the bottom of the cooking sheet. Mix one egg white and 1/4 cup of Parmesan cheese with the whole bag of cauliflower and mix together. You can use whole cauliflower that you put in the food processor and make your own but I was all about a quick dinner. Let cauliflower sit in a strainer or as I did, just push with a paper towel. Since it wasn't fresh there wasn't much water. Get as much water out as possible for a crispy crust. Put down on parchment and shape into your pizza bottom. I like the rustic shape, mostly oblong. Put your toppings on and put back in for about 7-10 minutes until lightly browned and cheese is melted. Now for the best part, EAT!